Angiotensin II, by activation of its brain AT1-receptors, plays an active role as neuromodulator in dopaminergic transmission. These receptors participate in the development of amphetamine-induced behavioral and dopamine release sensitization. Dopamine is involved in cognitive processes and provides connectivity between brain areas related to these processes. 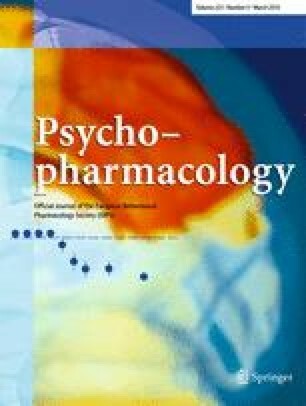 Amphetamine by its mimetic activity over dopamine neurotransmission elicits differential responses after acute administration or after re-exposure following long-term withdrawal periods in different cognitive processes. The purpose of this study is to evaluate the AT1-receptor involvement in the acute and long-term amphetamine-induced alterations in long-term memory and in cellular-related events. Male Wistar rats (250–300 g) were used in this study. Acute effects: Amphetamine (0.5/2.5 mg/kg i.p.) was administered after post-training in the inhibitory avoidance (IA) response. The AT1-receptor blocker Losartan was administered i.c.v. before a single dose of amphetamine (0.5 mg/kg i.p.). Long-term effects: The AT1-receptors blocker Candesartan (3 mg/kg p.o.) was administered for 5 days followed by 5 consecutive days of amphetamine (2.5 mg/kg/day, i.p.). The neuroadaptive changes were evidenced after 1 week of withdrawal by an amphetamine challenge (0.5 mg/kg i.p.). The IA response, the neuronal activation pattern, and the hippocampal synaptic transmission were evaluated. The impairing effect in the IA response of post-training acute amphetamine was partially prevented by Losartan. The long-term changes induced by repeated amphetamine (resistance to acute amphetamine interference in the IA response, neurochemical altered response, and increased hippocampal synaptic transmission) were prevented by AT1-receptors blockade. AT1-receptors are involved in the acute alterations and in the neuroadaptations induced by repeated amphetamine associated with neurocognitive processes. Natalia Andrea Marchese and Emilce Artur de laVillarmois contributed equally to this work. The online version of this article (doi: 10.1007/s00213-015-4153-1) contains supplementary material, which is available to authorized users. This study was supported by grants from CONICET 11220120100373CO-KB1, SECyT, FONCyT PRESTAMO BID PICT 2476. The authors are grateful to Estela Salde and Lorena Mercado for their laboratory technical assistance. All procedures were handled in accordance with the NIH Guide for the Care and Use of Laboratory Animals as approved by the Animal Care and Use Committee of the Facultad de Ciencias Químicas, Universidad Nacional de Córdoba, Argentina (RES 46 2015).